Posted on November 8, 2014 by No Map Required Posted in Costa Rica, Places	. MACAWS!! We saw scarlet macaws on our very first day! Think about when the Blue Angels fly in formation…that’s what it was like. We were buzzed by a flock of big colorful birds. That was a pretty incredible welcome to this new place!! It’s official: We are really traveling now! It was one long day, starting with an early, early wake up in Atlanta, but our trip is really started now! After what seems like a lot of talking and blogging…we finally left the country. We caught the four hour flight from Atlanta to San Jose, Costa Rica. Interestingly, Delta insisted that we arrive 3 hours before our international flight. We almost spent more time at the airport than on the plane. Kind of funny… kind of. We were told repeatedly that we couldn’t enter CR without “proof of onward travel”, which typically means a plane ticket home. In our case, it was a bus ticket to Panama. Aaron spent hours getting those tickets. It was stressful and a total pain, but with all the warnings on the Internet forums of close calls and people having to pay big bucks to fly back home, we took it seriously. So, of course, we zipped through check-in and security in record time. A bit dissappointing when everyone took us at our word that we would, in fact, leave CR within 90 days. If only would have asked to see the confirmation because we were ready! After arriving in CR and easily navigating customs we had to find Denny’s. Yes, Denny’s of Grand Slam Breakfast fame. From there the shuttle would take us to Tamarindo. We stood outside Denny’s for a couple of hours and then the bus came. They had told Aaron he had purchased “the last two seats” but maybe they meant “the only seats”. With that we had a private driver the whole 5 hours to Tamarindo which was just incredible! He and Aaron practiced english/spanish. We got a few hours of lessons on CR politics (multi-party democracy), education (mandatory), and local cuisine (fish, rice, fresh fruit). Thank you, Miguel and Interbus! “Yes, yes, that’s all well and good,” we hear you cry, “but what about those macaws?? ?” They came when we stopped after 3 hours for a break from the drive. 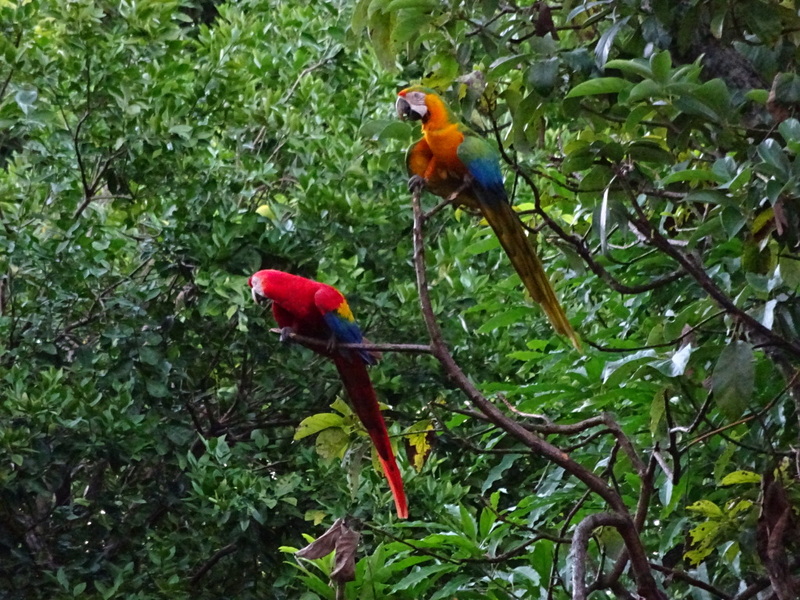 Stretching our legs, getting some snacks and viewing macaws…pretty darned nice. I love macaws. They are just as amazing as Costa Rica. A great place to start your adventure. Have a great visit. Never heard of the spiny fruit. I’ll just have to return to CR and try them. I can’t remember if you are going to Singapore. The Jurong Bird Park is there. Largest in number of species and land area in the world. Includes around 30 threatened species. Also, I think the macaw on the right is a different kind of macaw, not scarlet, unless it’s a juvenile. I’ll do a bit of checking for you. Just checked. The bird on the right is a blue and yellow macaw. Lovely birds. Thanks for the update on the macaw, Casey! There were definitely a few with different colors, so I’m not at all surprised. We’ve been seeing variety galore and expect to see some amazing ones in the next few days as we head up to Arenal and Monteverde, the Cloud Forest. Bring on the toucans!!! We’ll also keep Jurong on our list if we make it to Singapore! Glad to, Lori! Going to be lots more as we go along. Hopefully toucans at our next stop! Anner!! You are travelling the world! Thanks Elena! !We are at Arenal Backpackers Resort and 5 Star Hostel….hands down the nicest hostel I have ever stayed in! Your place sounds lovely too. Any other La Fortuna or Monteverde suggestions, we are going to be here a while! We are loving it!